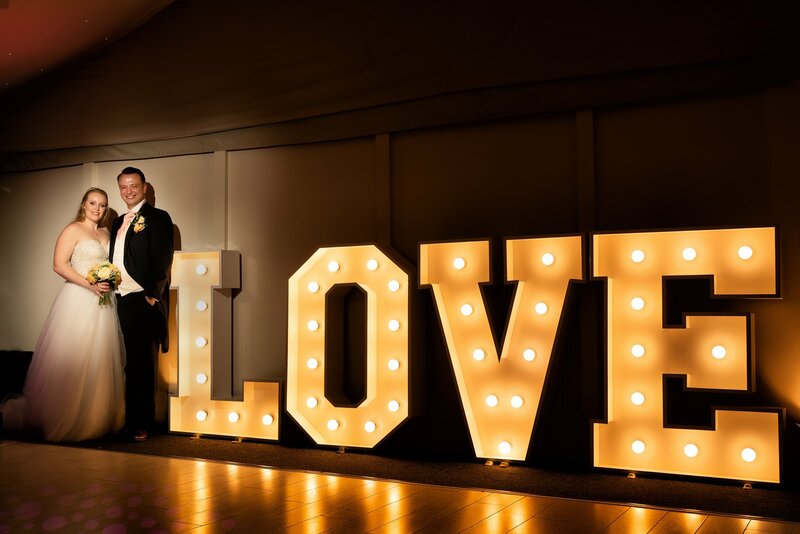 Guests at the wedding of Laura Evans and David Lee were treated to the magic of the movies – after the pair used their favourite films as the theme for the day. The couple met when they were just seven years old and new members of Ashbourne Town Band’s cornet section – and they are still active members of the band today. 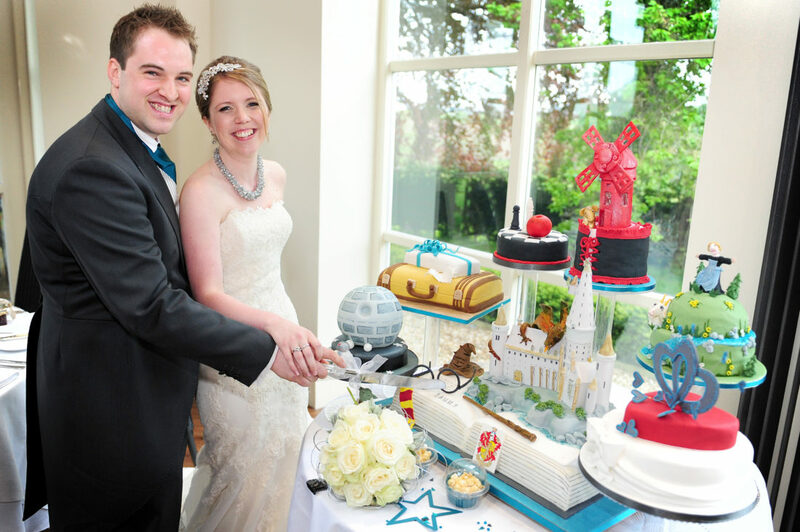 The big screen theme to their wedding day incorporated their favourite movies – Harry Potter, The Sound of Music and Star Wars were among those to make the cut. And while Laura, 28, and David, 27 acted out their own love story, guests were treated to plenty of film props – including popcorn box menu cards, movie trivia cards and a cake with a tier based on each film. 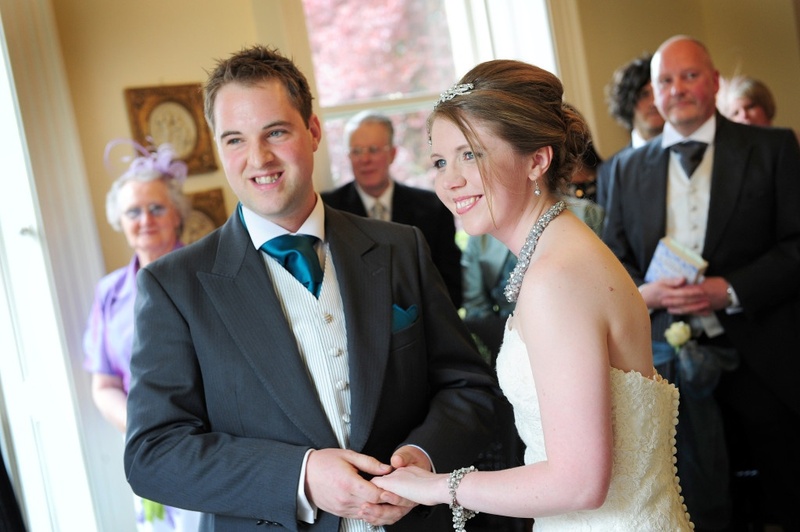 How we met: We met when we were seven years old and were both learning to play the cornet. I joined Ashbourne Town Band and David and all his family were members. Years later we ended up in the same form at secondary school and we started going out when we were 17 years old. Even though I went to university and subsequently trained to be a solicitor we stayed together. To this day we are still members of the band. Proposal: We had been together 11 years and we both knew we would get married when the time was right, so it wasn’t a total surprise, although I didn’t see it coming that night. He took me to the spot where we had our first kiss – which was actually near my mum and dad’s house, after he had walked me home one night. David had even bought the ring, which he’d got from Avanti, in Ashbourne. It’s very unusual as it features seven diamonds. He knew it was perfect because I love Harry Potter and in the books (and films, of course) seven is the most powerful magical number. I absolutely adore the ring, it’s really unusual and exactly the sort of thing I would have chosen. Wedding date: We got married on May 18th, 2013. We chose May because recently the weather has been really lovely at that time of year – but on the day it was very overcast and a bit chilly. It didn’t rain, but it was annoying because on the bank holiday, a couple of weeks before, it had been beautiful weather. Shottle Hall: Because we live in Ashbourne, it’s only 20 minutes away, so we had already heard of Shottle. 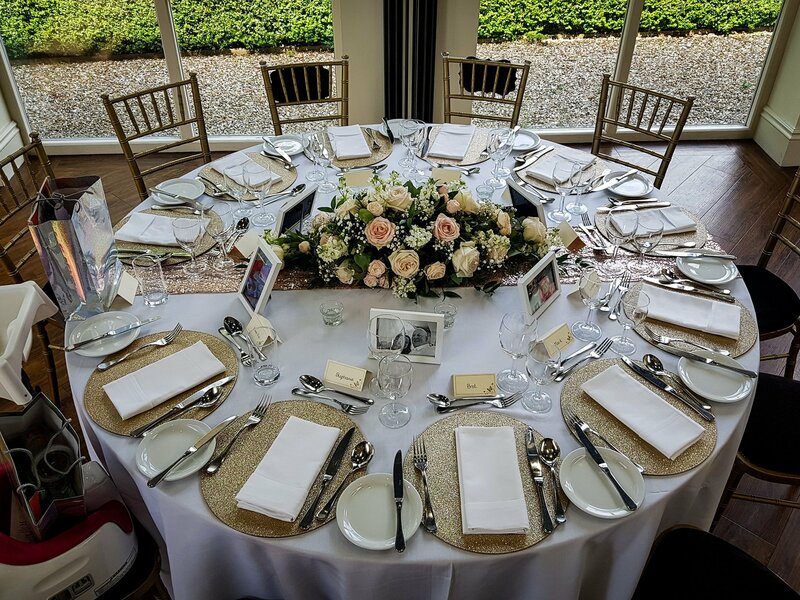 We looked around a few other places on open days, but Shottle ticked all the right boxes – it had bedrooms, the packages were perfect, the staff were really friendly and the ceiling in The Orangery was fabulous. Dress: I went to Mimi Toko, in Duffield, and actually ended up buying only the third dress I tried on. I thought I would want a frilly, sparkly princess-type dress, but the one I fell in love with was fishtail and very fitted. It was ivory, very lacy and by Enzoani. Hair and make-up: My best friend and bridesmaid Helen Carolan used to be the manager of a salon in Ashbourne but now runs her own hairdressing business called Helen Marie Hairdressing from the Nail Bar in Ashbourne – so she did my hair. As I didn’t want her to have to do her own hair on the day, as a surprise, I asked another friend to come and do my make-up and Helen’s hair too. Bridesmaid: Helen wore a long dark charcoal grey dress which we bought in the Bullring, at Birmingham. I’ve known Helen for years because we were in the same year at school, but we really got to know each other through the band. Best man: David chose his dad as his best man, which was lovely. David lived with his dad after his parent’s split up and they work together too, so he was the perfect choice. Suits: We hired suits for David, his dad, his stepdad and my dad from Brigdens in Derby. We expected them to be really expensive, but actually found them to be extremely competitively priced. We chose morning suits with tails, but not top hats, in dark grey. David had a teal cravat and all the dads wore charcoal grey ones. Flowers: I chose Rowan Tunaley Flowers, because Rowan was also in our year at school and has a real eye for detail. 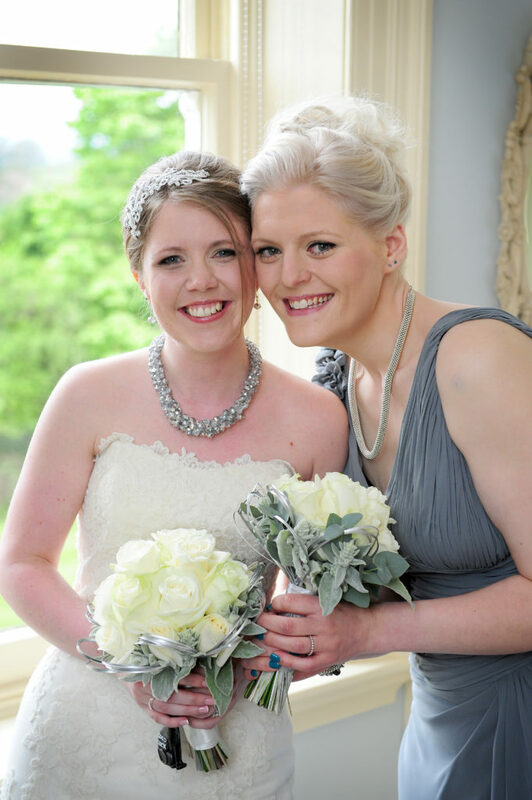 Helen and I both had hand-tied bouquets of avalanche roses, with silver hoops and some grey-coloured furry leaves for texture. We also had martini vases with the same flowers in them on all the tables. 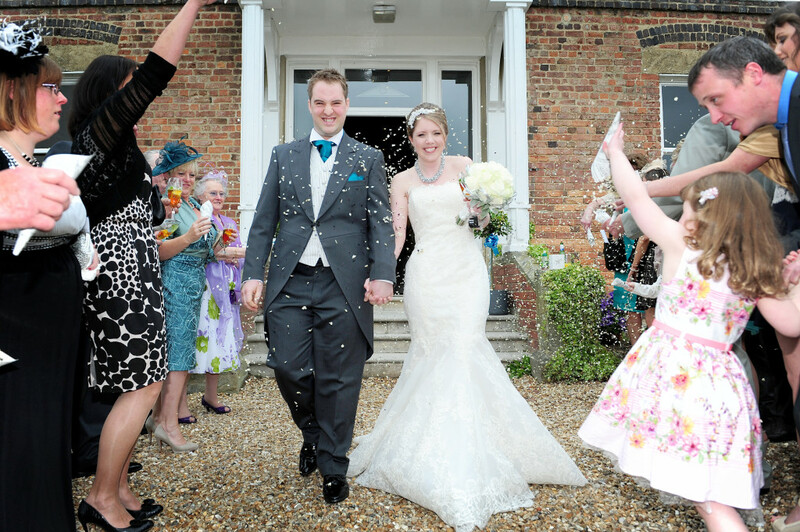 Theme: First of all we chose a colour scheme for the wedding which was charcoal grey and teal. But then we decided we’d like to take the theme a bit further and so we went for movies, which ran right through our day. Ceremony: I walked down the aisle with my dad to Marry You by Bruno Mars and it was a very special moment – having waited 11 years! We had two readings; the first was read by David’s stepdad and was a passage from Captain Corelli's Mandolin about two trees growing together, which seemed appropriate because David is a joiner. The second was A Lovely Love Story, which is actually about two dinosaurs and was read by Dave’s stepmum. It is a really sweet story, which brought a smile to everyone’s faces. 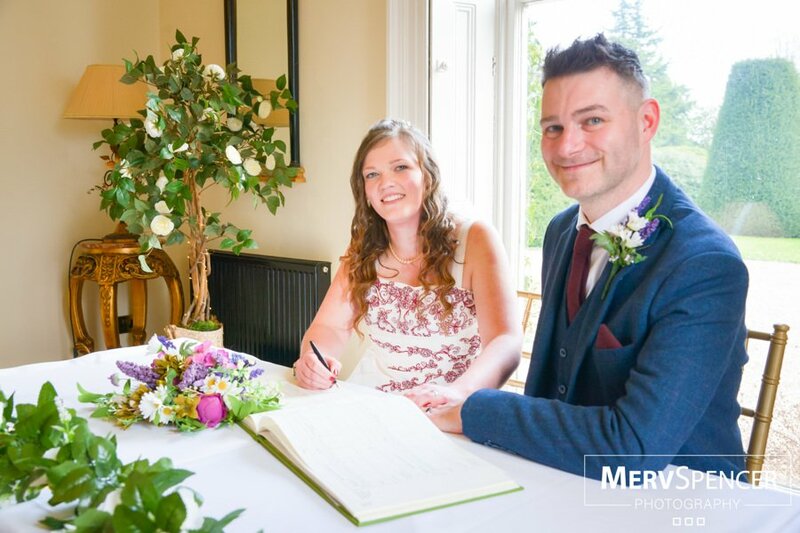 During the signing of the register we had three songs played – one called Grow Old with You, which is actually from the film The Wedding Singer, Adele’s Make You Feel My Love and Michael Buble’s Home. I felt quite emotional when the registrar was talking about couples planning their weddings – because we’d been planning ours for such a long time. I managed not to cry though; I didn’t want to ruin my make-up! We walked out as man and wife to McFly’s It’s All About You. 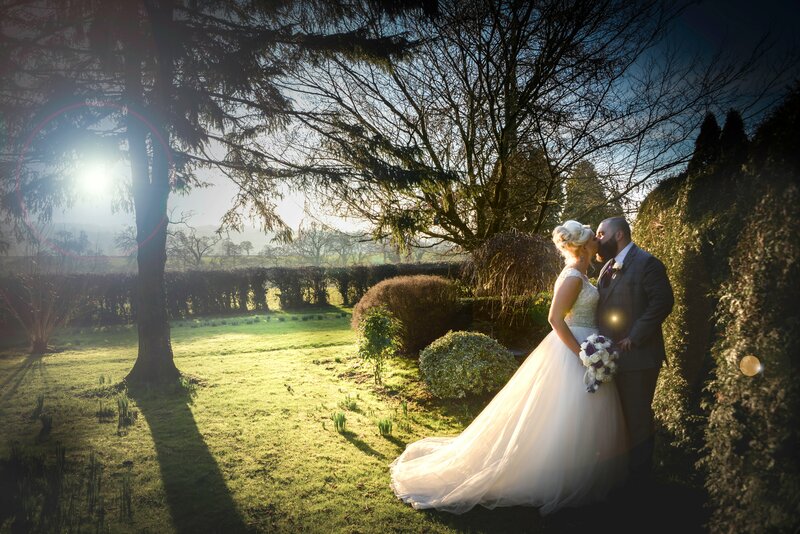 After the ceremony we went off with the photographer and our guests enjoyed Pimms and Peroni and some gorgeous canapés – smoked salmon and cream cheese blinis and roast beef and horse radish mini Yorkshire puddings. 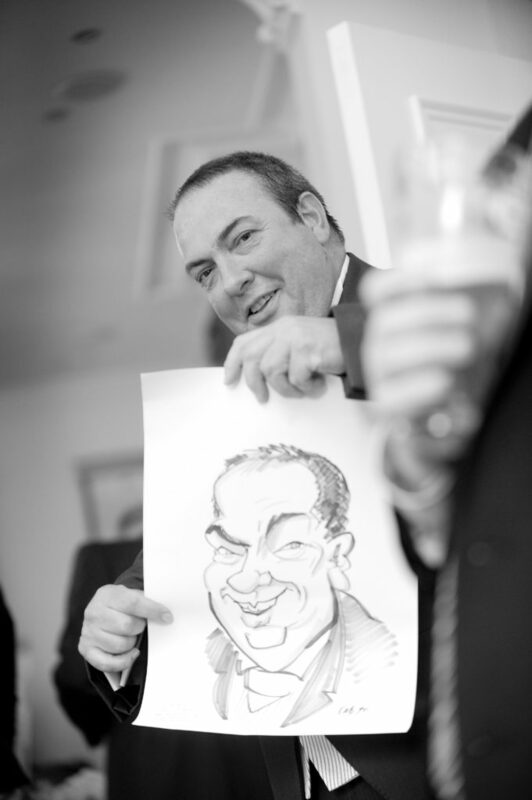 We also brought in a caricaturist called Sensible Pencil to draw pictures of people while they were waiting. We had ours done too and it was brilliant. I made confetti cones out of the sheet music for two of our favourite films – Star Wars and Sound of Music. On one side of the cone it was the part I play in the band and on the other it was David’s. Reception: We named all our tables after our favourite films: Harry Potter, The Sound of Music, Forrest Gump, Twilight, Moulin Rouge, Love Actually and Star Wars. We put movie trivia cards on the tables to keep conversation going and we put props out for the children relating to the table they were on – for example Harry Potter glasses, or a Darth Vader mask. We had popcorn box menus made for each table, which also featured a list of all the music playing throughout the reception from our favourite films. All of our stationary for the day and our invitations were from Charlotte at Orange Blossom Design in Buxton. We did the speeches first so that everyone could relax and enjoy the meal – which was pate to start and sausage and mash for our main course. We had 63 guests for the day and I made a charm for everyone’s glasses – with little beads spelling out their names. For the favours I made jam and chilli jams in little jars and handwrote labels with their names on them and a little message on the back. Evening: We had 120 guests in the evening and they danced the night away to a band called Siblings, a four piece from Ashbourne. One of them is our next door neighbour and they are an amazing band – they’ve been on television quite a few times on programmes like Inspector George Gently and Hollyoaks and Jo Whiley has played them on Radio Two. Although David and I are known for not being able to dance we did do a first dance to Lucky by Jason Mraz & Colbie Caillat. We had a hog roast and also a platter of cheese and biscuits in case there were any vegetarians. Dave made a traditional candy cart for the sweeties and he also made a traditional village signpost with signs pointing in different directions. We put all the locations the guests had travelled from on it and instead of putting how many miles to each destination, we put how many guests had come from each place and used the song lyric – ‘don’t count the miles, count the I love yous’ by way of an explaination. Cake: My mum has made cakes since she left school and used to work in The Gingerbread Shop, in Ashbourne. She doesn’t operate a business as such, she just gets asked to bake by word of mouth. She’s done it all my life – as a child I can’t ever remember going to someone’s birthday party without having to take the cake with me! 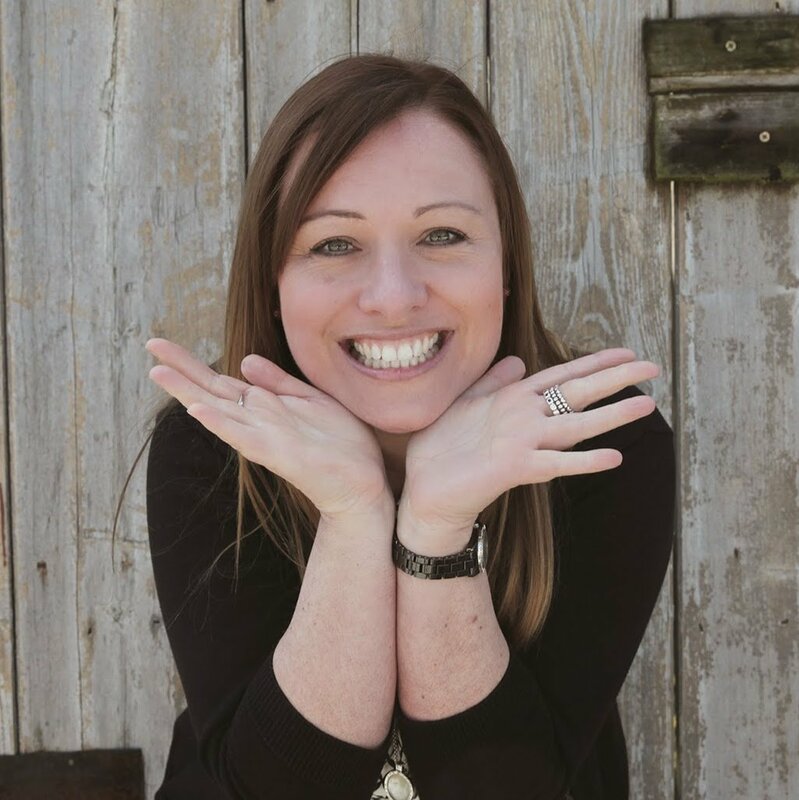 She’s really artistic and so when we were deciding on a cake I knew it had to be something really amazing – people wouldn’t have expected a traditional three tier white wedding cake, although mum does make plenty of those. 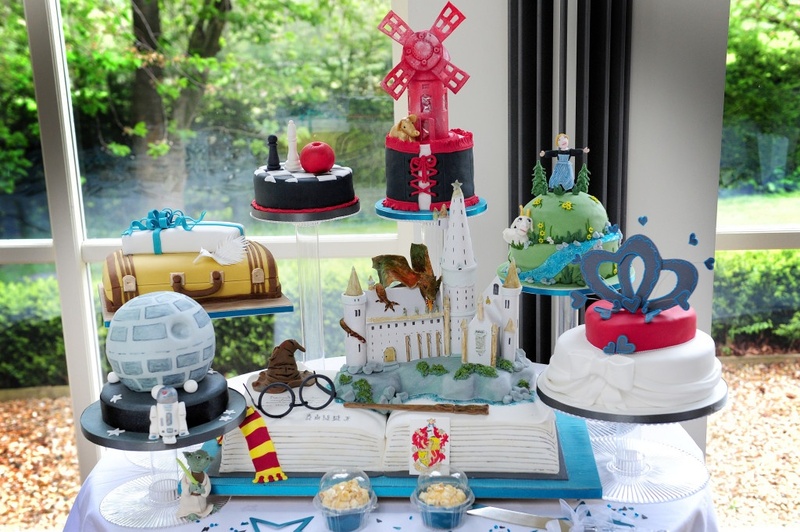 So, we went for the movie theme and had a tier for every film – including one that had Hogwarts from Harry Potter on the top! We had an elephant and a windmill for Moulin Rouge, a chess piece and an apple for Twilight and so on. We took the cakes over the day before the wedding when Shottle was hosting an afternoon tea and all the guests were taking photographs of it. Mum also made me some cupcakes with popcorn on the top for the children – she was pretty busy in the run up to the wedding as you can imagine! 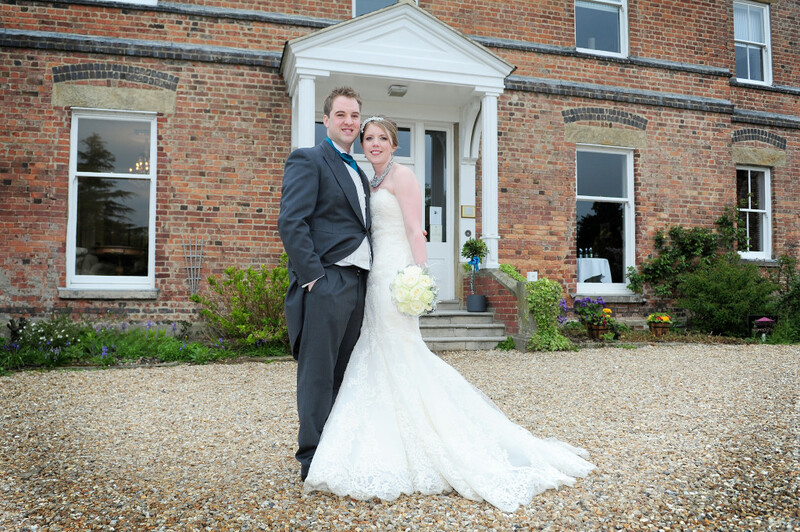 Photographer: Our photographer was from The Studio, in Mickleover and he was with us from 12 noon to 6pm. We liked the fact that you could employ them by the hour instead of buying a package which usually includes things you don’t actually want. 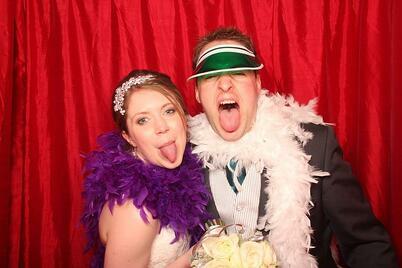 We also had a photo booth in the evening from Distinct Event Solutions, which was really popular. We used the photo booth a year before to make our Save the Date cards, in each picture we were holding up a sign saying each word and the finished card looked a bit like a film reel. They provided a box of props and each picture was stuck into a guest book which the person wrote a message alongside. Honeymoon: We went to Mexico for two weeks. It was the first time I had ever been on holiday for two weeks and it was blissful.